How Do I Build My Writing Portfolio? Do you want more clients to hire you as a freelance writer? The question is undoubtedly yes. How do you show them what you’re capable of? How do you prove you have the experience they’re looking for? How do you convince them to hire you? One of the most important things that can help is your writer portfolio. But how exactly do you build one? Use any number of the options below to develop content for your portfolio. A great way to get started building your writer portfolio is to contribute a guest post to a relevant blog. That’s because you’ll almost always earn a byline. Plus, you might even land a paid guest post. Just check out Sophie Lizard’s Ultimate List of Better Paid Blog Gigs to find a blog that pays. One problem with guest posting for samples is that you might specialize in content other than blogging. That means a blog post may not be the best sample for your portfolio. However, you can make it work for you. For instance, if you specialize in writing travel brochure content, contribute to a travel blog. Do you have a friend who is in need of marketing or business material? Why not offer to create content for him/her that you can use in your portfolio? This gives you a bit of experience working for real clients, and you may land a paid contract. For instance, let’s say your friend is a teacher. She wants to send out a newsletter to parents detailing the classroom objectives for the next quarter. Offer to write the newsletter for her. She’ll likely be happy that it will save her time, and it will give you a sample for your portfolio. Writing for free isn’t all bad. Many non-profits are looking for writers who are willing to create content for free. If you find work with a well-known non-profit, this can be a great piece for your portfolio. You’ll be able to add a well-known client to your portfolio, and you could end up with a nice testimonial. Not sure where to find opportunities with non-profits? Start with local nonprofits, or check out Idealist.org, where you can find volunteer and job opportunities with nonprofits. I do mention this because I think it can be effective in the right industry, but most of the time I’d advise writers to avoid creating samples solely for the sake of having clips. For example, I see writers create a blog on their website just so they have some samples. However, let’s say you’re offering contract writing services for the legal industry. You probably wouldn’t want to post an actual contract for the public to see. Creating a mock-up version is a good idea in this case, and then you could use it as a template later in your business. I won’t give you an ultimatum and say you should never create a mock piece. However, this doesn’t give you the experience working for a real client. Being able to put a publication or business name next to your sample–even if you do it for free to begin with–shows prospects that you have experience working with clients. As an added bonus, working with other people to get your samples gives you a chance to gather client testimonials before you’ve even landed your first official client. Be sure that you’re getting a byline for the project. It’s okay to put ghostwritten content in your portfolio if you have permission, but having the byline can add to your credibility. If you can find a paid opportunity, go for it! There’s no shame in working for free to begin with to build your portfolio, but why do a project for free when you can get paid for it? If you’re doing work for free, be sure you’re getting something else out of it, such as links, a testimonial, or exposure. For example, contributing for free to a high-authority blog in your industry can be a great marketing and exposure tactic. And of course, don’t forget that you can use your client pieces in your portfolio (as long as you didn’t sign a non-disclosure agreement), so if you don’t want to work for free, shoot for landing your first client without any portfolio clips (yes, it’s possible). 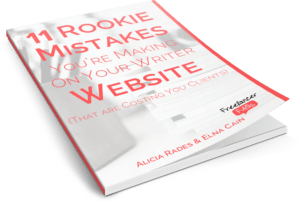 How are you working on building your writer portfolio? Let me know in the comment section. How Do I Set Myself Apart From Other Freelance Writers? What Basics Do New Freelance Writers Need for Quick Success? This was a very informative blog for all levels of freelancers. Since a lot of my work comes from a single source that I have an NDA with, I cannot use my ghostwritten work for my portfolio. Fortunately, I do have some byline work that I do monthly – if I could just remember to post it to my website once it is published that would be great. I have actually gotten two writing jobs based on my online portfolio, so I know your advice is excellent. Now, I have to go update my portfolio………. This is very unusual, engaging and useful piece of writing…..just,what do i say,a sort of doing it playfully if you choose by not getting scared at all but at the same time taking care of what people expect from you….. but I am not so sure about it but heard somewhere that commenting on continuous Guest Posting liable to the risk of invoking Google’s penalty?